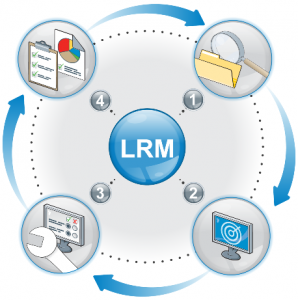 With LRM, you will achieve greater visibility across your IT assets while optimizing your resources to intelligently address IT risk exposure and achieve effective compliance through strong security practices. Identify: Identify the criticality of IT assets and their support of key business processes to define an IT risk profile. Assess: Automatically assess your technical and procedural controls for compliance with interfaces to third-party tools and web-based surveys. Remediate: Prioritize and address technical and procedural control deficiencies and assign and track results. Manage: Create operational and strategic visibility across compliance, IT Risk, and control environments with role-based and dashboard reporting.